Yeah, we got s*** last night! You heard me… snow! There, I said it! Two inches of heavy, icy, crap all over everything. It's supposed to be sunny today and the temps are over freezing now. I'm expecting to not have to deal with the frozen stuff –much– when we take Tasha to the vet late this morning. It's a followup visit and an expected second antibiotic injection. (She continues to improve, by the way.) In the mean time, as I've said before, it's a good thing those "delicate" spring flowers are really quite tough; look what happened to one in our patio garden. ← More like a tiny cape? Oh no. Not more snow. I had hoped that most of us had seen the end of the snow!! So sorry. I hope your vet visit goes very well! Awww…! That was such a beautiful flower! We, thankfully, didn't get any of that s***. Glad to hear about Tasha – poor suffering kitty.That photo is too pretty to be true! 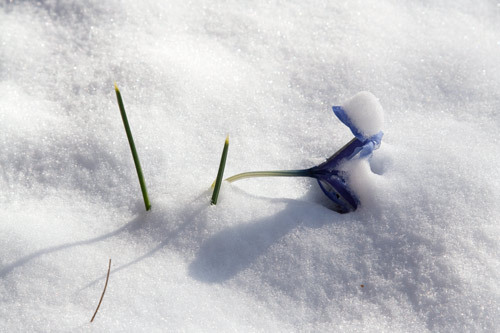 It looks as if the snow has turned to sugar, and how could it destroy a poor lavender iris? I will continue to hope that she improves every day! She is fortunate to have such loving owners! !